1. an air route, esp one that is fully equipped with emergency landing fields, navigational aids, etc. an approved route for regular flights of transport planes. The route is provided with maintained airfields and with the necessary ground-support equipment (radio beacons, air lane identification markers, and the like) to insure safe takeoff and landing. Civil aviation flights are generally carried out on airways. In some special cases—for instance, when servicing expeditions or rendering emergency medical assistance—flights are carried out independent of any airway. The first Soviet airway was inaugurated in 1923 between Moscow and Nizhnii Novgorod (now called Gorky). In 1968 more than 2,500 airways (with a total extent of about 500,000 km) constituted the consolidated network of the USSR Aeroflot system, linking about 3,500 cities and populated points within the country and 44 foreign countries. 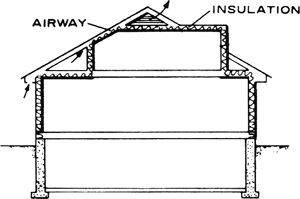 A passage for ventilation between thermal insulation and roof boards. A passage for air in a mine. Also known as air course. A designated route of passage for aircraft. Some of the legends on airways for aeronautical charts. A control area, or a portion thereof, established in the form of a corridor (ICAO). An airway is equipped with radio navigation aids. It is a path through navigable airspace designated by the appropriate authority within which air traffic services are provided.